We witness a further acceleration of technological change that affects the basic rules within companies. In this scenario Big Data, Internet of Things (IoT), real-time analytics, mobile, business networks, Industry 4.0, the future of customer service, the integration of People, Talent and Culture are set to play a key role. The technological revolution is changing company and industry-wide structures, regardless of their success up to now. Business models must be rethought for a new setting that requires closer customer involvement, enhanced agility and ongoing innovation. 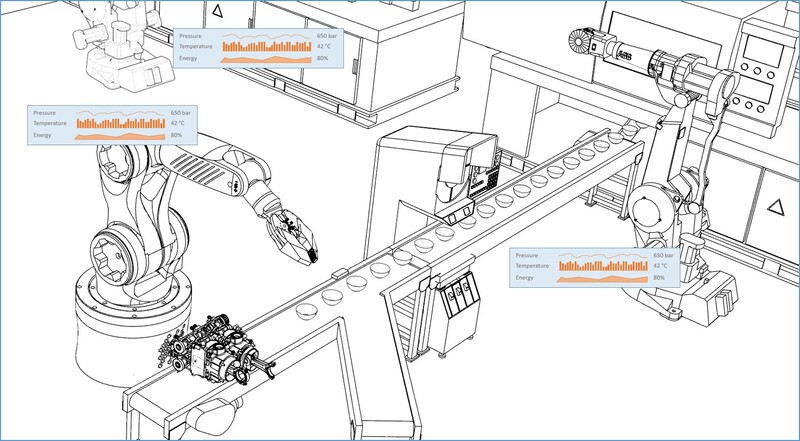 The evolution of technologies and customer expectations combined with market pressure requires manufacturers to continuously optimize their industrial processes. Improving the performance of the supply chain and plants is vital to reducing costs and bringing innovative and high-quality products delivered on time. How can this impactful trends be understood, how can companies deal with their impact and how could they be managed to harness their potential benefits? This use-cases blog series will bring the first response and help to understand how SAP with the next-generation ERP business suite as the “digital core” can helps companies to become a Factory of the Future. The Available-to-Promise function (ATP) is one of the important functions in the enterprise and supply chain. The fundamental role of this function is to provide customers with requests for information on product availability. In addition, the ATP function must ensure that the promised quantities can be delivered when promised. Traditionally, ATP is reduced to a simple consultation of the production master plan or supply, this is called conventional ATP. But under the pressure of the competitive global environment, companies need a tool to support the decision to respond to mass production and personalized customer. Indeed, the conventional ATP is not able to adapt the supply to a variable application operating on a short-term and containing a small amount of products (see Blog related to Segment of One in the previous Use-Cases series [link]). The ATP functionality is a critical component that requires more complex models as in the digital World, more complex mechanisms are necessary for varied production, variable demand and multiple stock localizations. In this context, in SAP S/4HANA, we have developed of a more efficient ATP system supporting this dynamic and moving environment. The advanced ATP (aATP) as part of the next-generation business suite, SAP S/4HANA, addresses these challenges. The major goals pursued with the implementation of aATP are the improvement of time to delivery, the reduction of the number of missed business opportunities and the enhancement of revenue and profitability. In the first version of aATP, part of the 1610 release, we made Data and Process innovations in Backorder Processing and Sales Product Allocation. We develop also a new concept of confirmation strategy and finally the Product Allocation in SAP S/4HANA 1610 has a completely new design and implementation based on neither SAP ECC nor SAP Advanced Planning and Optimization (APO). A rush order is the last minute customer order after the production plan of a company has been concluded. For these rush orders, appropriate and reasonable response is imperative as it could put strain on customer relationship and services. A good and positive response could help the company to build and retain its market share in today’s highly competitive markets. 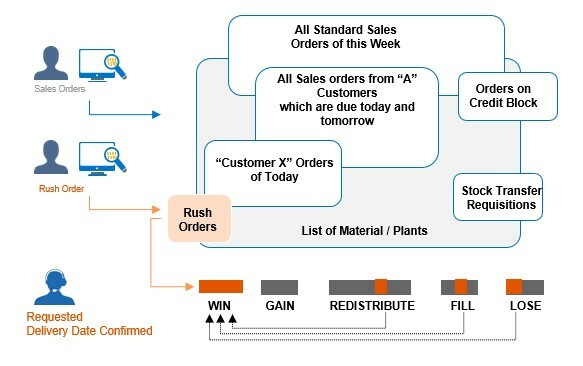 The prioritized fulfillment sequence of rush customer demands can be reached with the new aATP based on the fulfillment ability and the prioritized new confirmation concept. With the new concept of confirmation we introduce in SAP S/4HANA 1610 the new “Winner –Gainer – Loser” concept with five confirmation strategies based on a multi-step filter & prioritized confirmation strategy (Advanced Back Order Processing (BOP)). There are five different predefined confirmation strategies: Win, Gain, Redistribute, Fill and Lose. And for the records, this has been available in S/4 Cloud with 1608 already. Looking forward meeting you at our next blog talking about the technical view concerning the advanced ATP for SAP S/4HANA 1610. Really informative, looking forward for further process details and configuration. Thanks for your innovative article on aATP. a. aATP will fully replace traditional ATP process or could be implemented alongside ATP ? b. FSCM Credit Management has utilized ATP process when we apply dynamic check rule. As such, any changes are expected for the behavior of FSCM-CR ? I can answer your first question. As of 1511 On-premise edition, with S4 system; you have flexibility to use your old “ATP” check process (or) activate AATP at ATP group level and use the latest ATP technology using the In-memory processing of HANA (or) enable an integration model and let the ATP check take place in your gATP system. So., total 3 options as of today. Could you explain how you’re managing FSCM Credit management with ATP ? It would be interesting to know. a): The traditional ATP in ECC 6.0, the Database table VBBS contained pre-aggregated sales requirements. The requested (OMENG) and confirmed (VMENG) quantities were aggregated on a daily basis. With the new SAP S/4HANA aATP, we do not need pre-aggregation anymore, and therefore this table is obsolete. Instead of the VBBS we use the VBBE, where each ATP-relevant requirement is explicitly stored. The classical ERP-ATP check code is also redirected to use VBBE. This mean that you can continue to use the classical ATP in SAP S/4HANA. The new aATP develop for SAP S/4HANA 1610 is a new state-of-the-art ATP, only existing in S/4HANA, want to bring new functionality and processes (Winner-Gainer-Loser Concept) needed for the digital market. At the same time, we want to simplify the aATP customizing so that the End-User can do it directly via the SAP Fiori apps. The gATP will not be replaced, and may can continue to exist as a side-by-side installation. b): The check rules are not yet available with the 1610 release, but are on the roadmap for the 1709 release. In this case, we recommend as a side-by-side installation with the gATP. Is there a CDS view from wich I can just read the ATP-Information? Can you please give more details on ATP. frankly telling i have started reading S/4 HANA details module wise from your blogs. nobody wrote this kind of blogs..please make it a complete reference page. so that every consultant will get benefited. Thanking you.